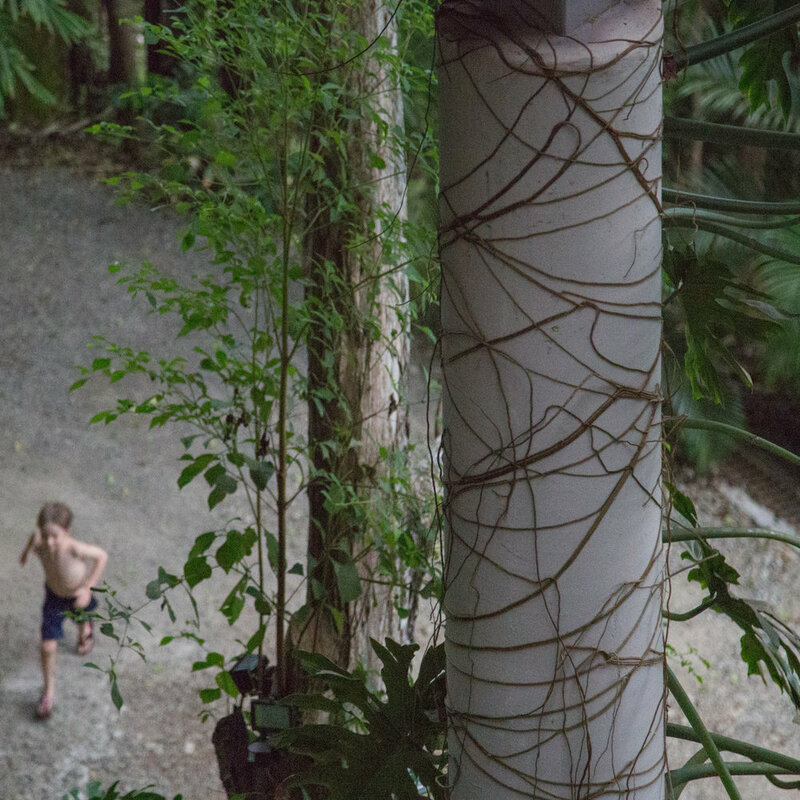 "The house offers a unique living experience floating above the canopy of the jungle, totally surrounded by nature. It combines expansive ocean views, luxury interiors with premium service, infinity swimming pool, and all within walking distance to the beach. The breezes. Three prefab living and sleeping “pods” are set up high on concrete piers and connected with a bamboo walkway. Air circulates through the house keeping it naturally cool and insect free. It’s an elegant solution to a complex problem. Living in nature. Each morning at the break of dawn we would open the wooden shutters and watch a nature show unfold: butterflies, birds, monkeys, raccoons, frogs, toads, bats and coati. We would listen to the roar of ocean waves below and watch the rain fall. The entrance. When you arrive, you see the structure dramatically perched far above your head. The house is entered via a sequence of concrete, stone and wood steps, which is all very theatrical. The engineering. How did they build this incredible house on such a steep slope in the middle of a jungle? It took our breath away. Wow! The pool. Perfectly placed beside the house with it’s own private deck tucked under the house. Pure luxury. The location. A quick walk to the beach and a short drive to Santa Teresa.